EncapSulite’s lamp sleeves are designed for safelights used in darkrooms and other graphic arts applications. 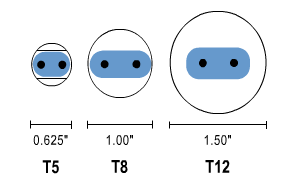 Our safelight sleeves are available in T5 (0.625”), T8 (1.00”), and T12 (1.50”) sizes and three standard lengths (18”, 24”, 48”), making it easy to find the lamp sleeve you need. Order fluorescent or LED light sleeves for your safelights today, or request a quote. Contact EncapSulite for more information. Not sure which of our safelight sleeves is right for your application? View our safelight chart for help in finding the lamp sleeve you need. EncapSulite safelight filters are designed for use with standard white fluorescent or LED lamps only. Not suitable for HO or VHO lamp types.